This document is a technical summary of the Federal Highway Administration report of the same title (FHWA-HRT-14-058). High-speed signalized intersections present unique challenges to improving highway safety. Techniques for achieving safety often have an adverse effect on efficiency, and techniques for achieving efficiency sometimes have an adverse effect on safety. Bonneson et al. developed an alternative dilemma zone1 detection-control system (D-CS), which overcomes the limitations of traditional multiple advance-detector systems. (1) The new system intelligently forecasts the best time to end the signal phase based on consideration of vehicle presence in the dilemma zone, vehicle type (i.e., truck or car), and the presence of vehicles waiting for a conflicting phase. 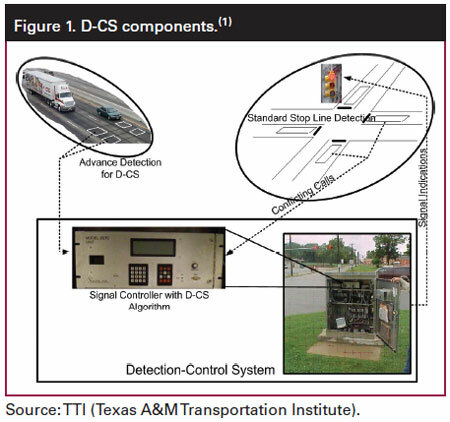 Figure 1 shows D-CS and its relationship to the vehicle-detection systems at an intersection. D-CS uses two inductive loop detectors in each major-road traffic lane in a speed-trap configuration; they are monitored by an enhanced signal controller. This controller uses the detector output to compute vehicle speed and length. The controller then uses the data to determine the best time to end the phase. These detectors are located 700 to 1,000 ft upstream of the intersection on both of the high-speed approaches. A key feature of D-CS is that it can forecast, in real time, when each vehicle on each major approach will arrive at and depart from its dilemma zone on the intersection approach. This forecast is based on the D-CS measurement of each vehicle's speed and time of passage at the upstream detector speed trap and distance from the upstream detectors to the stop line. Verify the D-CS design objectives through rigorous field instrumentation—at the moment of signal change from green to yellow, no truck shall be in the dilemma zone, and no more than one passenger car shall be in the dilemma zone. Quantify the effectiveness of D-CS in improving safety and reducing dilemma-zone-related crashes and red-light violations at rural, high-speed, signalized intersections. Identify the upper limit of traffic conditions under which the D-CS can operate safely and effectively. Data collection for this analysis occurred at six sites located in four States where D-CS was already installed or where the State was ready to install D-CS. Site selection involved finding jurisdictions that were willing to support the research activities. States that chose to participate were Florida, Louisiana, Illinois, and Texas. Texas Transportation Institute (TTI) also initiated communications with Naztec-Trafficware representatives to request their support for the project. Number of vehicles caught in the dilemma zone at the onset of yellow. Number of times a phase reached the maximum green limit (max-outs). The data analysis for each of the three MOEs developed summary statistics using about 1 h of data for each main street signal phase at the associated intersection location. The study observed more than 1,300 signal cycles at the 8 locations. Collectively, the intersections had both very low and very high traffic flow rates (120 to 1,512 vehicles/h). They also experienced a wide range in cycle lengths (57 to 127 s), adding a desired breadth in the range of conditions represented. The red-light-violation rates provide some indication of the extent of red-light violations at the intersections studied. The discrepancy as to which locations are the worst (by comparing violations per 1,000 vehicles and violations per 10,000 vehicle-cycles) illustrates the importance of considering both volume and number-of-cycles when computing the red-light-violation rate for location-based comparison or evaluation. The vehicle-cycle-based rate logically represents a more reliable measure of the propensity for red-light violation than the vehicle-based rate because it accounts for two measures of exposure to a red-light violation. A regression analysis indicated that relationships existed between red-light violation frequency and exposure (expressed as the ratio of flow rate to cycle length), location, and type of detection-and-control system used. Findings indicate that the regression coefficient associated with each of these factors was significant at a level of confidence that exceeded 95 percent. The analysis indicates that the after study periods experienced 82 percent fewer red-light violations than the before study periods. The regression analysis also included vehicles in the dilemma zone and max-out frequency. The after study periods experienced 73 percent fewer vehicles in the dilemma zone than the before study periods and 51 percent fewer max-outs than the before study periods. However, the max-out percentage varied widely among locations, and it was relatively infrequent at all locations except one. It appears that the change in detection and control reduces max-out frequency, but the trend is not known with certainty. The available data make it impossible to rule out the possibility that the max-out frequency actually increased in the after period. One would intuitively expect a correlation between max-out phases and red-light running. However, the research team did not explicitly test the correlation between these two metrics in this research. The maximum allowable headway is always shorter with D-CS compared to a multiple loop system, so D-CS will naturally result in fewer max-outs. The before detection strategy was not always the same for the test sites, so the authors ran the model again using a qualifier variable indicating whether the intersection had functioning upstream detection for dilemma-zone protection in the before period. However, the results indicated that after study periods experienced 85 percent fewer red-light violations when there was no advance detection in the before period and 79 percent fewer violations when there was advance detection. Similarly, they indicated that the after periods experienced 77 percent fewer vehicles in the dilemma zone when there was no advance detection in the before period and 66 percent fewer vehicles when there was advance detection. These results are statistically significant. A similar trend was found in the percentage of max-outs, but these results were not statistically significant. TTI increased the maximum green setting in the D-CS controller at one intersection to test its upper limit. The trend in the data indicated that the max-out frequency decreased with increasing maximum green duration. The number of max-outs decreased by 43 percent when operating the intersection with an 85-s maximum green relative to a 75-s maximum green, and the number of max-outs decreased 57 percent when operating at a 95-s maximum green, relative to a 75-s maximum green. However, the results of this analysis indicate that the trend in max-out frequency was not statistically significant. Thus, it appears that a longer maximum green setting may reduce max-out frequency, but the trend is not known with certainty. The primary objective of this component was to evaluate before-after crash data collected by the four States to determine the effectiveness of D-CS in reducing motor vehicle crashes. This section reports on a statistical analysis to evaluate the effectiveness of D-CS on reducing total (TOT), fatal-plus-injury (FI), and angle-plus-rear-end (angle + RE) crashes. The reason for combining some categories was to increase the sample size. The factors that affected safety have changed in the same way from before the improvement to after the improvement for both the treatment and the control groups. The changes in the various factors influence the safety of the treatment and the control groups in the same manner. The analysis results suggest that D-CS has no effect on TOT and FI crashes but reduces angle + RE crashes by 9 percent. The standard deviation of this estimate of average safety effect is 15 percent, so at 95-percent confidence level, the result is not significant. This result can be attributed to the small sample size. Achieving a significant result at the 95-percent level would require a larger number of treated sites, a larger period of crash data, or both. The installing agency should consider D-CS at new high-speed (over 45 mi/h), isolated intersections whenever multiple advance detection might otherwise be a good fit. For existing intersections with multiple advance detectors, decision makers should consider replacing the existing system with D-CS when the existing system's design life is realized. Extensive simulation and field study have shown that the system is able to function safely and efficiently for all levels of traffic demand. However, its performance degrades with frequent turning activity from the major road approaches. For this reason, its benefits will diminish as the total turn percentage (i.e., the sum of the left-turn percentage and the right-turn percentage) increases. Performance has been acceptable when the turn percentage is less than 40 percent. Higher than normal truck traffic. Locations where approach speeds vary significantly. Locations with high crash rates (especially rear-end and angle). Table 1 summarizes the criteria discussed above and the recommended threshold values that justify the use of D-CS. The last two entries in this table, truck traffic and crash frequency, are considered important, but the other criteria are more critical in determining when to use D-CS. Bonneson, J., Middleton, D., Zimmerman, K., and Charara, H., Intelligent Detection-Control System for Rural Signalized Intersections, FHWA/TX-02/4022-2, Texas Transportation Institute, College Station, TX, August 2002. Middleton, D., Longmire, R., Charara, H., Bonneson, J., Geedipally, S., and Ko, M., Field Evaluation of Detection-Control System, Interim Report, Texas Transportation Institute, College Station, TX, July 2010. Bonneson, J. and Son, H., "Prediction of Expected Red-Light-Running Frequency at Urban Intersections," Transportation Research Record 1830, Transportation Research Board, Washington, DC, pp. 38–47, 2003. Hauer, E., Observational Before-After Studies in Road Safety, Pergamon Press, Elsevier Science Ltd., Oxford, United Kingdom, 1997. Hummer, J.E., "Appendix A: Experimental Design" in Manual of Transportation Engineering Studies, Institute of Transportation Engineers, Washington, DC, 1994. Researchers  Dan Middleton of TTI was the principal investigator for FHWA contract DTFH61-08-C-00033 Field Evaluation of the Effectiveness of Detector-Control System (D-CS). The contract was managed by Wei Zhang of Office of Safety R&D, For more information about this research, contact Wei Zhang, FHWA Project Manager, HRDS-10, (202) 493-3317, wei.zhang@dot.gov. Availability  This TechBrief may be obtained from the FHWA Product Distribution Center by email to report.center@dot.gov, fax to (814) 239-2156, phone to (814) 239-1160, or online at https://www.fhwa.dot.gov/research. Key Words  Dilemma zone, detection-control system, D-CS. Notice  This document is disseminated under the sponsorship of the U.S. Department of Transportation in the interest of information exchange. The U.S. Government assumes no liability for the use of the information contained in this document. The U.S. Government does not endorse products or manufacturers. Trademarks or manufacturers' names appear in this report only because they are considered essential to the objective of the document. Quality Assurance Statement  The Federal Highway Administration (FHWA) provides high-quality information to serve the Government, industry, and public in a manner that promotes public understanding. Standards and policies are used to ensure and maximize the quality, objectivity, utility, and integrity of its information. FHWA periodically reviews quality issues and adjusts its programs and processes to ensure continuous quality improvement. 1 The dilemma zone represents a length of roadway on the intersection approach within which drivers are collectively indecisive as to whether to stop or continue when presented with a yellow signal indication. The upstream edge of this zone is typically defined as being 5.5 s travel time from the stop line. The downstream edge of this zone is typically defined as being 2.5 s travel time from the stop line.